As former SNL hands Bill Hader and Conan O’Brien discussed on Thursday’s edition of the new, revamped Conan, literally everyone who’s worked at Saturday Night Live does an impression of executive producer Lorne Michaels. Sometimes it’s just behind closed doors, and sometimes the impression is immortalized in major motion pictures. (Mike Myers’ infamous Dr. Evil gets all the press, but Mark McKinney’s oft-overlooked evil drug company CEO in Kids In The Hall: Brain Candy is even better.) And sometimes, it’s Bill Hader putting his own, decidedly darker spin on his former boss. Noting that other SNL alum Fred Armisen once pointed out that notorious name-dropper Michaels habitually rubs his eye in mock-boredom when relating tales of dining out with his impressive roster of famous pals, Hader started imagining that Michaels’ entourage also encomapsses the world’s most notorious serial killers. Hader’s impression might be more about mannerism—he still sounds a lot like Bill Hader—but it’s a little masterpiece of absurdist characterization, as his Michaels berates seatmates “Alec and Marci” for calling his arriving guest “BTK Killer.” “You know, his name’s Dennis,” Hader’s Michaels sneers languorously. Emmy-winner Hader is an unfailingly delightful guest, breaking out a killer impression of Barry co-star Henry Winkler, and telling Conan about his upcoming role as the grown-up jokester Richie Tozier in It: Chapter Two, and how his seeming inability to play terror is proving a slight handicap in the Stephen King sequel about a murderous clown-demon. Maybe so, but even funnier than his Lorne was Hader’s impression of himself, trying and failing to react with appropriate horror to, again, a killer clown-demon. (He has a tendency to smile when he’s scared, to the constant irritation of the film’s director, Andy Muschietti.) Not helping matters is the now-famous behind-the-scenes picture of Hader making Bill Skarsgård’s Pennywise (the aforementioned clown-demon) crack up, something Hader said made him abruptly freeze in a terror-smile when Skarsgård revealed that he can really do that creepy thing with his eyes. These Recommended Stories Have Everything . 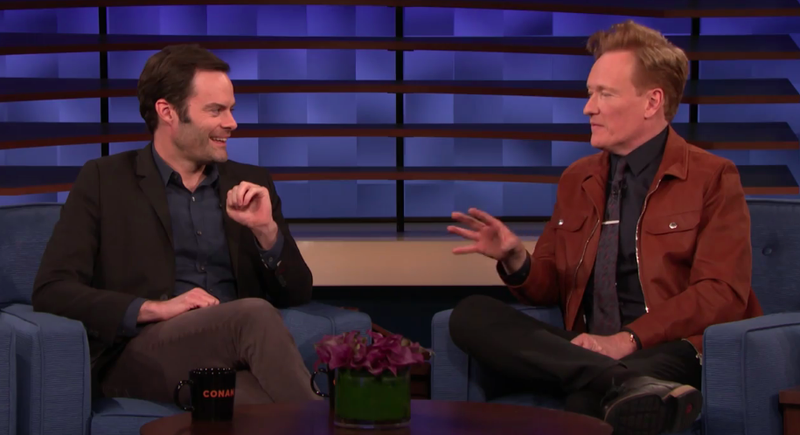 . .
Bill Hader kills people on Conan, talks killing people on Jimmy Kimmel Live!